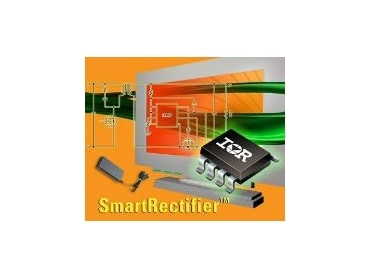 INTERNATIONAL Rectifier, represented in Australia by Arrow Electronics , has introduced the IR1167 SmartRectifier IC for ac-dc power converters for laptops, mini-PCs, LCD and PDP televisions, game systems and other digital computing and home entertainment systems. The SmartRectifier IC simplifies and improves efficiency in secondary synchronous rectification (SR) in high power flyback and resonant half-bridge converter circuits, enabling smaller, cooler designs. The device employs a new technique for precise, direct sensing of voltage thresholds across the SR MOSFETs, allowing fast, accurate control to minimise power losses. The IR1167 can increase overall system efficiency by 1% and reduce MOSFET temperature by 10°, while slashing SR parts count by 75%. The IR1167 SmartRectifier IC uses IR's proprietary HVIC technology, making it compatible with all MOSFET gate types and offers direct connection to IR's wide range of 30V to 200V SR MOSFETs. The benefits of the IR1167 SmartRectifier IC are further enhanced when used with IR's MOSFETs featuring optimised on-resistance and gate charge characteristics, such as the IRF7853, IRFB4110 and IRFB4227. These optimised MOSFETs work with the IR1167 as a "total chip set solution" to further maximise efficiency and power density in SR circuits. Since the new IC works independently from the primary control, it can be used in a variety of transformer switching modes and applications with capacitive output filters. Independence from the primary side means that the IR1167 operates in low power "burst modes" to enable "1W Standby" and California Energy Commission (CEC) 80Plus compliance. The SmartRectifier technique halves the losses dissipated in the SR MOSFET. This reduces the number of MOSFETs needed or allows a change from large TO-220 packages to small, surface mount SO-8 parts. The IC is available in either SO-8 or DIP-8 packages which are lead-free (PbF) and compliant with the Restriction of Hazardous Substances Directive (RoHS).